Last October, when I saw crowds forming around the wall of the DSW Building on West 79th Street, I feared the worst- an accident. As I walked closer and saw people snapping pictures with iphones, I realized it was a hit-and-run of an artistic nature. Banksy had swooped in, under cover of darkness, the night before and bestowed upon our neighborhood one of his signature works. When Banksy hit the streets (and walls) of Manhattan this past October, his month-long “Better Out Than In” residency caused the usual excitement. The internationally notorious “anonymous” British graffiti artist had the city abuzz, looking for where his art might next turn up around the five boroughs, via website and Instagram postings of the rough locations of that day’s work. Many of the surprise pieces followed Banksy’s trademark street-art style: stencils spray-painted on streets, walls of buildings and under bridges. Fans were concerned, but not surprised when a post on his website read only, “Today’s art has been canceled due to police activity”. Most of Banksy’s pieces don’t last long after they are spotted, either defaced by local graffiti artists who resent the intrusion of an outsider on their turf, or relocated and preserved to be sold to galleries and collectors by whomever owns the property Banksy happened to choose as his canvas. Often, Banksy’s work is quickly dispensed with by a landlord, with a quick coat of paint. It is with particular fascination that I have watched the evolution, in my Upper West Side neighborhood, of “our Banksy” on West 79th street. In an unusual example of neighborhood pride, or brilliant marketing, Saul Zabar, who own the DSW Building on 79th and Broadway (Zabar’s is at 80th and Broadway) immediately leaped to preserve the Banksy by securing it with a custom-cut piece of heavy-duty plexiglass. I observed, over the next few days, that it was not the Banksy that was vandalized, but Saul’s plexiglass, which was first spray-painted with red graffiti-like marks (darn, wish I had caught that on film), and then shattered. I saw Saul, sadly observing the broken plexiglass one afternoon. I tried to cheer him up by telling him that I appreciated his role a patron of the arts. He smiled. Last week I noticed Saul’s latest addition to the Banksy plexi: “Help Zabar’s Protect This Unusual Work”Now when I walk past the current Zabar’s window display with the header “Looking for the Perfect Spot?” featuring a delightful picture of Saul posing with our Banksy and a pyramid of the 2014 Zagat Guide to New York City Restaurants, I have to wonder, what is being marketed here? 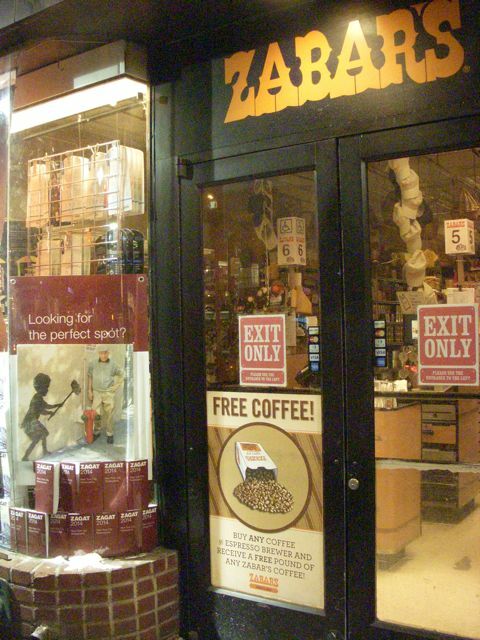 Zabar’s as a perfect spot to shop, Zagat as the go-to guide for dining or a Sol Zabar owned building as the perfect spot for graffiti artists who’d want their work to receive TLC? What would Banksy say? Sol Zabar has the right idea in taking responsibility for the environment around his establishments. I have had a hard time in convincing the shop keepers on my Broadway block to even pick up the trash in front of their stores a few inches beyond the legal responsibility. Several of them said it is “too expensive” and they are too busy to spend 5 minutes a day removing the trash and it is the city’s responsibility. That may be — but the city isn’t willing or able to do this on a regular basis. 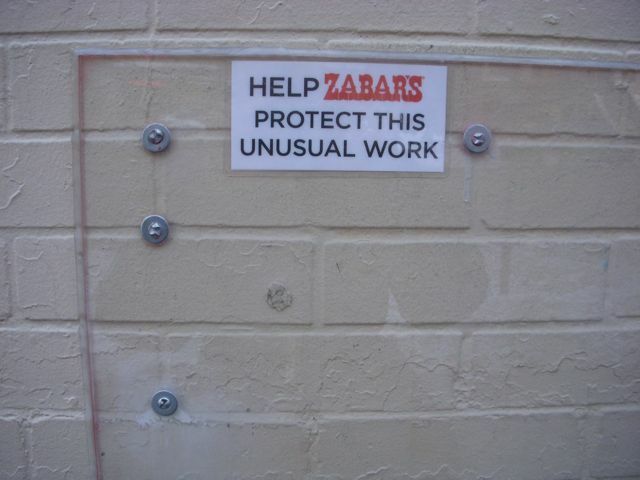 Zabar’s financial investment in the outside environment is really impressive. This made me nostalgic for my Upper West Side days. I loved Zabar’s and there is nothing like it in LA. 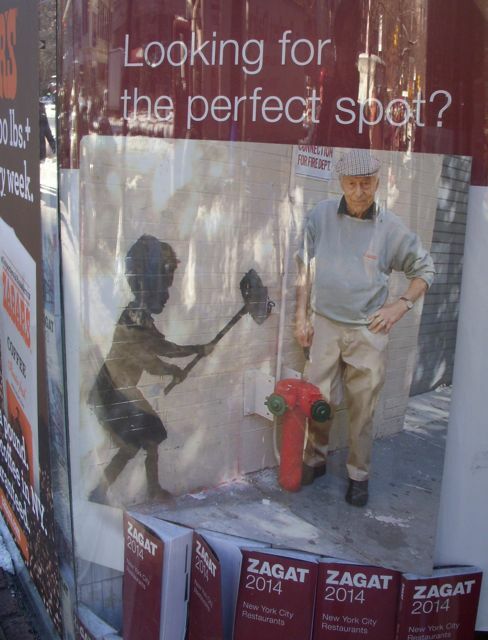 I’m not a big fan of Banksy, although I like the image here, but I do admire Mr. Zabar for taking a stand. Very sad that someone would actually smash the plexiglas. 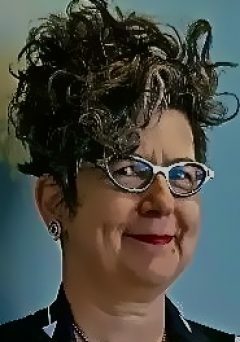 I am the Sol Zabar on our block……I pick up when I am so inclined the doggie poop bags that people are too lazy to dispose of and the trash that the garbagemen leave on the lawns and sidewalks.